Little Ace falls into the class of guns that aren’t really good for anything, but that firearms afficionados find fascinating anyway. It is a tiny single-shot .22 short derringer with a sheath trigger, patterned after the rim-fire derringers of the late 19th Century. 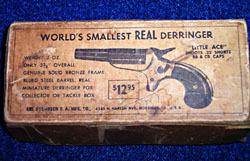 Manufactured by Erl Svendsen, he claimed it was the smallest real derringer in the world. Little Ace rated a brief mention in the 1972 Gun Digest in an article by DeWitt E. Sell entitled “U.S. Handguns Since World War II,” and is also listed in the Blue Book of Gun Values. There was a local hardware store in Austin, Texas that carried them in the early 70’s, along with Svendsen’s “Four Aces,” which was a four-barrel .22 short derringer with a rotating firing pin on the hammer. I recall that Little Ace cost about $20 in the 1970’s. My rent at that time was only about $60 a month, and $20 seemed like a lot of money to spend on a gun that was really only a novelty, so I didn’t buy one. 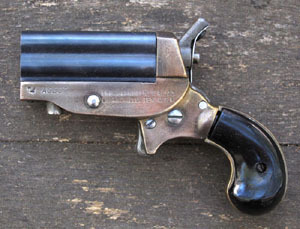 The earliest Little Ace guns were made in Norridge, Illinois beginning in 1961. But the majority of them were made in Itasca, Illinois. Finally, Erl Svendsen moved to Brownsville, Texas in about 1973, and made his last guns in that location. He eventually sold the rights to his guns to Herman J. Seminiano of Brownsville, Texas. Herman intended to continue to manufacture the pistols, but when he asked about the plans for the guns he was told there weren’t any. All of Earl Svendsen’s guns were made by hand and were hand fitted. There were no interchangeable parts. A German derringer collector, Kurt Kuemmel, has many photographs of the Little Ace derringer on his website. Erl called his company the Erl Svendsen Fire Arms Manufacturing Company, or ESFAC for short. Later he also made guns under the name 4 Ace Manufacturing Company, Inc.
Little Ace is marked “LITTLE ♥ ACE” on the left side (with the heart in a square). On the right side the early guns are marked “.22 BB & CB CAPS”, and the later guns are marked “.22 SHORT / STD. VEL. ONLY”. On top, the early guns are marked “ERL SVENDSEN F.A. MFG. CO. / NORRIDGE, ILLINOIS.” Later guns were marked “ERL SVENDSEN F.A. MFG. CO. / ITASCA, ILLINOIS. U.S.A.” Later still they were marked “ERL SVENDSEN F.A. CO. / BROWNSVILLE, TEX. U.S.A.” on top. The last guns produced were marked 4 ACE MFG COMPANY, INC. / BROWNSVILLE, TEX. U.S.A. The in-the-white example shown here belongs to a friend of mine who removed the blue and added a pair of homemade horn grips (the original grips were cheap plastic and were not particularly well fitted). My friend had sewn a loop of leather onto the back of his belt for the barrel to fit in, and the tongue of the belt buckle fitted into a groove in the right grip. He could hook his right thumb around the grip, behind his belt buckle, and pull the gun out in a trice. I always had my doubts about how effective it would be, even at very close range, though it might have scared someone to death. The gun is impossible to hold steady under recoil–it is simply too small–so it is only usable up close. I think I’d much prefer one of the old .41 caliber derringers for self-defense. Pony Express Revolver - The Pony Express was a six-shot single-action-only revolver manufactured in both .22 Long Rifle and .38 Special. 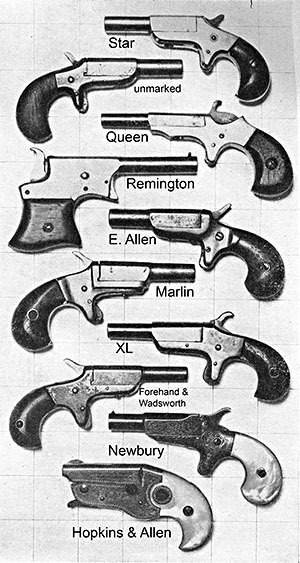 Most had six-inch barrels, but some longer barrel guns were also made. The Pony Express is said to be a copy of the early Ruger Single Six revolver--I don’t know if this is true, since I haven’t been able to examine one in person. The Pony Express was being advertised by late 1955, so it clearly preceded Little Ace. 4 Aces Derringer - This was a four-barrel “pepperbox” style gun that fired the .22 Short cartridge. I believe that manufacture started when Erl Svendsen was located in Itasca, Illinois. If anyone has one from Norridge, I’d be grateful if you could send me the serial number and some photographs. The late version of the 4 Aces fired the .22 Long Rifle cartridge. The gun continued to be manufactured in Brownsville, Texas, and formed the basis for the HJS Frontier Four derringer which was patented by Herman Seminiano (U.S. patent number D.274639) on 10 July 1984. Pocket Pony or Model 1 - This was a six-shot single-action revolver in .22 Long Rifle. The two that I have seen were stamped “Mod. 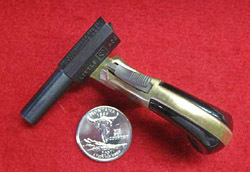 1,” but various posts on gun-related internet forums call it the Pocket Pony. Cased Sets - A small number of cased sets containing Little Ace, 4 Aces, and the Pocket Pony were made. The guns in each set have matching serial numbers with the “CS” prefix. I spoke to a gentleman who stated that he knew Erl Svendsen when he lived in Brownsville and Erl told him that he only made 100 of the cased sets. However, collectors have since written me, one with CS112, one with CS115, one with CS196, and another with CS200. 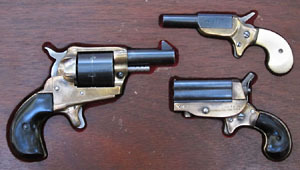 A scarce cased set of Erl Svendsen guns. Interestingly, there was an article in the May 1960 issue of Guns & Ammo magazine entitled “Miniatures in Firearms.” The article is about a gunsmith in Oregon by the name of William E. (Bill) May who made miniature firearms. 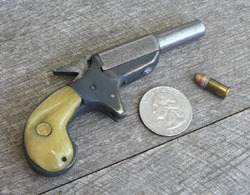 The gun that was featured in the article is a tiny derringer that looks remarkably like the Little Ace. The article gives considerable information about how Mr. May went about making his miniatures. I can’t help but wonder if Erl Svendsen wasn’t inspired by this article. 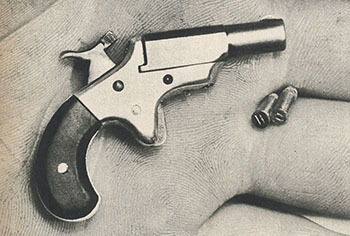 Hand-made derringer by Bill May. From Guns & Ammo magazine, May 1960. Logan, Herschel C., “Baby 22’s of Other Days.” American Rifleman, December 1950. Special thanks to Kurt Kuemmel for allowing me to reproduce photographs from his website.